You are here: Home » MEDIA » Books » Legion: The Many Lives Of Stephen Leeds by Brandon Sanderson (book review). 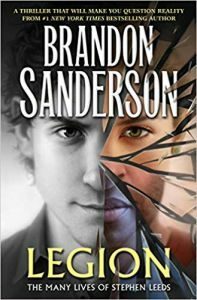 Legion: The Many Lives Of Stephen Leeds by Brandon Sanderson (book review). “That was fantastically, amazingly brilliant,” I said as he closed the cover on ‘Legion: The Many Lives Of Stephen Leeds’ by Brandon Sanderson. “The readers don’t care about the font,” Sabine interrupted in her dreamy voice. “I care,” Ruprecht said, slamming the book shut. He put it on the arm of the sofa and stalked back to his armchair. “This will be good,” Bartholomew sniped, smoothing his comb-over down with an enspittled hand. “You’re the critic, why don’t you write the book review?” I said. “I’m only your critic,” Bartholomew said smugly, safe in the knowledge that he would never write anything of his own to be critiqued. “Yes,” I said, crossing quickly to the desk and powering up the laptop. Olwen always had useful insights. The trick was to type them up before I forgot what he’d said. There was a long pause. Sabine and Ruprecht looked at Olwen expectantly. Bartholomew pointedly looked out of the window at the lawn that was in need of one final mow. “That’s deep.” Sabine nodded appreciatively. Bartholomew gave an arch-look and turned back to his contemplation of the garden. “But you think it’s brilliant?” Sabine prompted after a moment. “Such wonderful clichés,” Bartholomew said. “Okay,” I said. I opened a new word document and began to type. Snapshot by Brandon Sanderson (book review). « Sparrow Hill Road by Seanan McGuire (book review).